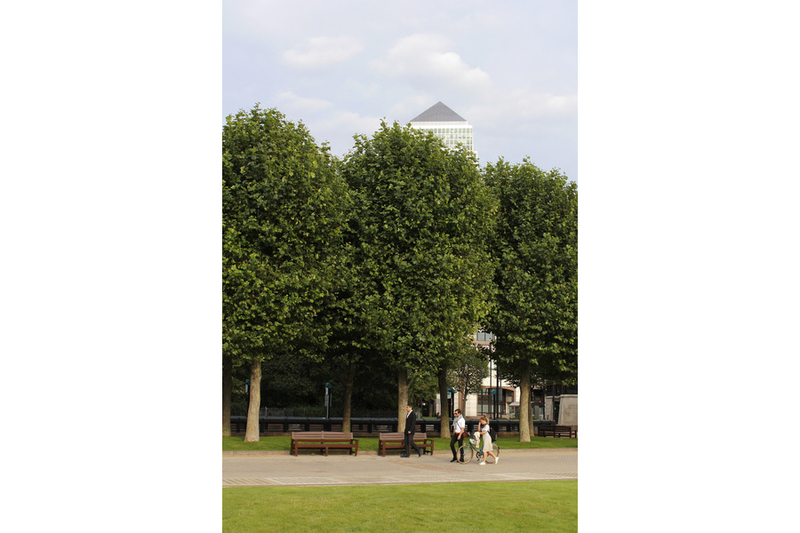 Canary Wharf is one of the world’s largest, most extensive landscapes over structure. Beginning as a derelict brownfield site in the docklands of London, it was transformed into a vibrant office and shopping district—now Europe’s financial center. The project represents OLIN’s commitment to revitalizing underused spaces in the urban realm and innovation in planting technologies. The design grew from a study of the place itself, and the place of which it was to become a part—the streetscapes and squares of London were the design inspiration. Areas of the city most analogous to the new streets, squares and plazas imagined for Canary Wharf were exhaustively photographed, analyzed and measured. Through this research, trees came to the forefront as a necessary design element. Although located over structure, the finished landscape was not to look like roof gardens with plantings in raised boxes, but rather like the terrestrial streets and parks throughout London. Tree pits were engineered to create an on-grade look for all of the plantings. Great care was taken to select and locate appropriate semi-mature trees and shrubs. To ensure the long-term success of the trees, an innovative, underground permanent guying system was developed.